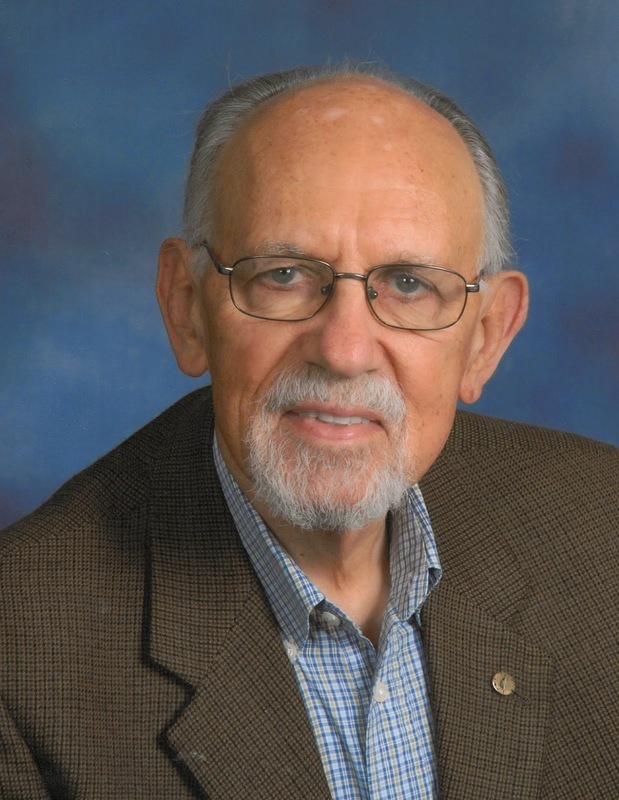 Come Celebrate Heifer International's 70th Anniversary! Heifer Sacramento volunteers are gearing up for a free local celebration for Heifer International's 70th year of working to end poverty and hunger while caring for the earth. Ours is one of 19 community events held around the country this year. Enjoy fun, interactive, and educational activities, learn about Heifer's early days for a 'sea-going cowboy', hear about Heifer's work in Ecuador, and honor communities coming together in support of Heifer's work. Rosa Rodriguez, the director of Heifer Projects in Ecuador and Bill Beck, one of the 'sea-going cowboys' and long time supporter of Heifer are the feature speakers at our celebration. See you at the party!! Heifer Sacramento Volunteers press contact. Check out Beyond Hunger - Celebrating 70 years of Family Farming. 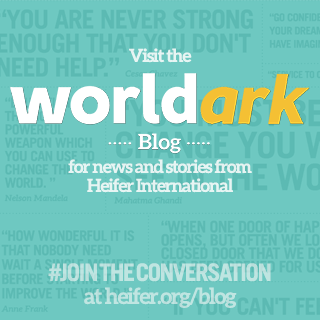 What is the Heifer Way for lasting change? How about a Heifer game app to send animals to needy villages? Heifer Games. Read stories of engagement from donors and participants on When Cows Fly. How does Heifer impact communities? Measure of Success. Find out where does Heifer work. 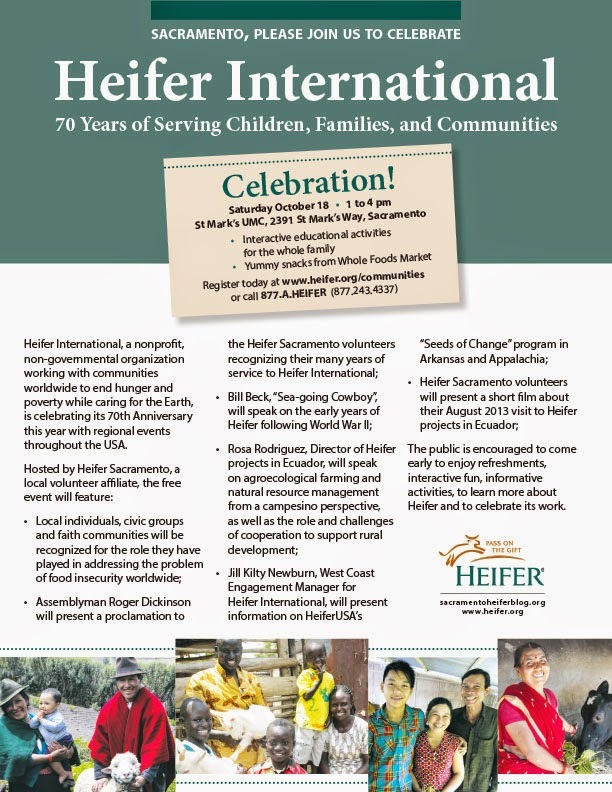 Heifer Sacrament volunteers will be holding a community celebration for Heifer's 70th Anniversary on Saturday October 18, 2014 from 1 pm to 4 pm at St. Marks United Methodist Church in Sacramento. Enjoy fun and educational activities and learn about Heifer's past, present, and future work to end hunger and poverty while caring for the earth. Stay tuned. More information will be coming soon!! This is the final to the series contributed by Heifer Sacramento volunteer, Cheryl McKinney on her experience visiting Heifer Ecuador projects in 2013. 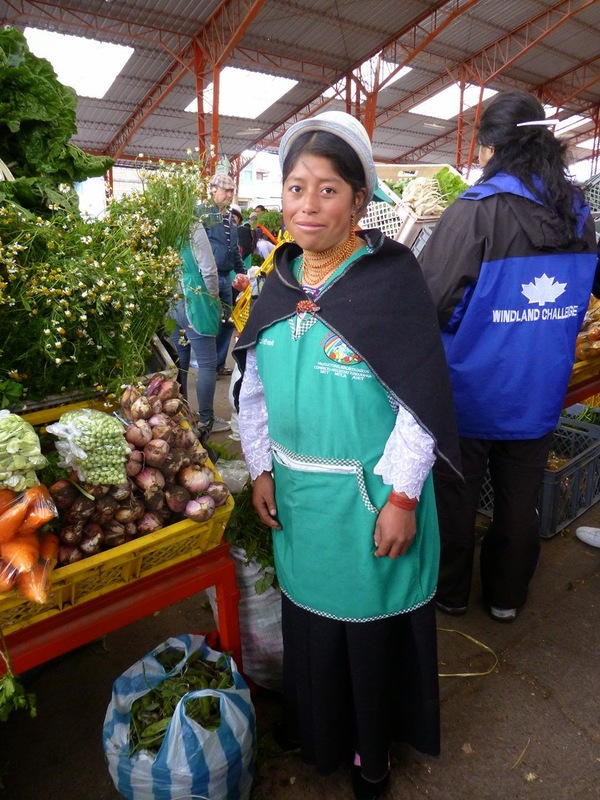 We Heifer tourists saw and learned a lot during one busy week in Ecuador. We came away having witnessed many ways in which the Heifer really does what it sets out to do. We had all arrived with the basic Heifer narrative in mind, which goes as follows. ● A community invites Heifer in to help with pressing problems. ● Heifer staffers, native to the project country, act as facilitators, engaging groups — in which women have full representation — to assess the community’s strengths, articulate goals and vision. ● Among the outcomes of this group process, sometimes taking months, will be decisions about specific projects to be undertaken. ● At the appropriate time, animals, plants, or other gifts arrive, and project participants sign promising to “Pass on the Gift” by donating an offspring animal or other offshoot of their specific project to the next family waiting to participate. ● The community is strengthened, in food security and networks of relationships. Thank you to Cheryl for sharing your view on the ground in Ecuador!